To celebrate CTE Month, states are taking the lead in honoring the students, educators, administrators, industry partners and all those it takes to make high-quality CTE happen in every community across the nation. Many states are using social media as a way to highlight CTE, with a focus on lifting up impressive student success stories. Arkansas is similarly highlighting student stories, in addition to using video to capture some amazing student projects, including this student-build hoverboard made in a CTE class! While North Dakota is using the hashtag #ND_CTE to showcase CTE Month activities and accomplishments. I Love Nebraska Public Schools released a new video for CTE Month, demonstrating CTE’s importance in career exploration, and that finding out what you don’t love, is just as important as finding out what you do. Signing up for the CTE: Learning that works for America® campaign is a great way to get the word out about CTE at the state and local level. We’ve created both national and state-specific Learning that works logos, as well as a number of resources and tools to help you make the case for CTE. Check out our fact sheets, tips for celebrating CTE Month, and a new guide to help you put the campaign into action. Maryland released a social media guide to help users get the most out of Twitter, Facebook, Instagram and Snapchat, and communicate about CTE in a way that most resonates with parents and students. Career Technical Student Organizations are also incredible resources to turn to throughout the month. Unfamiliar with Snapchat? DECA just released a guide on how to create Snapchat filters. 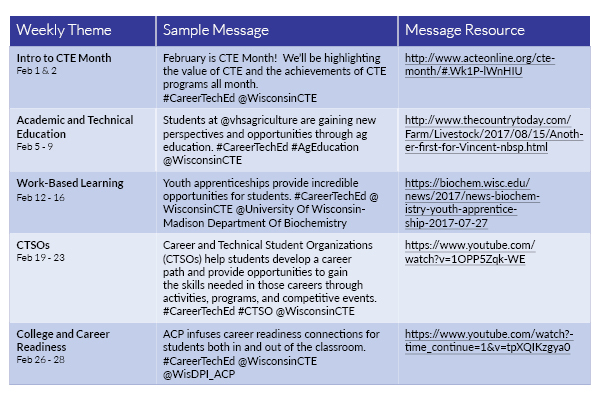 This entry was posted on Friday, February 16th, 2018 at 3:36 pm	and is filed under Advance CTE Announcements, Advance CTE Resources, CTE: Learning that works for America. You can follow any responses to this entry through the RSS 2.0 feed. Both comments and pings are currently closed.